One of the losses inherent in so many adoptions is a loss of personal history. The truth of what happened in a child's life up to a certain point simply vanishes. Recently, two seemingly insignificant moments drove this truth home to me. Mike travels internationally. It seems to be an unspoken law of nature that everything falls apart when Dad's away. During Mike's last overseas trip, Wenxin came down with a fever and a bad headache. When Wenxin's temperature rose to almost 105 degrees Fahrenheit, I took him to Urgent Care. The doctor thought he might have the flu. She began to ask me questions about his medical history. All I know of his medical history before we adopted him in 2010 is the scanty information in his adoption file. And who knows if that's even accurate? The doctor made an interesting statement. "If he tests positively for the flu, I'll prescribe Tamiflu for him. Generally, we aren't giving Tamiflu to kids this year. But since we don't really know his medical history -- for example, we don't know if he had problems with wheezing as a baby -- we'll err on the side of caution and give him the medicine." Most moms are experts on their kids' medical histories. Most moms remember if their kids ever had breathing treatments for wheezing, or were prone to ear infections or had food allergies. I don't know any of those things about my son. I'm only an expert on the last year and a half. Wenxin has lost a chunk of his medical history. The second incident occurred when Nathan brought home an ancestry assignment from school: Trace your family tree back to an immigrant or a Native American. I couldn't help but wonder, "How would Wenxin do this project?" I guess he could just write his name on the poster and turn it in. He is, afterall, an immigrant. Maybe it would just be an easy A. Or, he could, of course, trace our family history since he has been permanently adopted into our family. Our family tree has become his. He has been grafted in. But the issue isn't really "how to do the project." The assignment itself drives home an uncomfortable truth: Wenxin's original family history is a blank. We don't know the names of his birth parents. We don't even know for sure where he was born or on what date. That is a loss unique to adoption and very common with kids adopted from China. Recently I've been reading about DNA testing on some adoption message boards. There's a company called 23andme that will analyze youre DNA and send you a report containing info about your ancestral origins and your health. 23andme will also let you know if any of your relatives have submitted their DNA. You have the opportunity to anonymously ask them if they'd like to establish contact. As the database of kids adopted from China grows, in the future our children may have the chance to connect with distant cousins and maybe even siblings. It got me thinking. I wonder if future scientific developments will help our kids fill in pieces of their missing histories. I think it's likely. While I don't plan to do anything now, I'll be watching. When Wenxin is old enough to weigh in with his thoughts and desires, he may choose to let science give back some of the history he's lost. We'll see. Special Note: This week, Death by Great Wall, is getting a design makeover. If everything goes according to schedule (do makeovers ever go according to schedule?) we should have the reveal by the end of the week. Be sure to drop by and check out our new look! Dana, I copied your blog URL to a friend of mine at church. She has adopted a little girl from China and they don't have much history to tell her because she was found only wearing a man's shirt when she was a baby and then was adopted at about 16 mos old. (She just turned eight) Your blog is such a great comfort to many! Good luck on the makeover. Do you have to do keywords in your search engine optimization? I'm not as familiar with blog construction. Lynn, my knowledge of SEO is limited to the little I've learned researching it online. A few of my posts have started coming up in Google searches, but SEO is not something I focus on a lot. My blog has mostly spread through word of mouth so I really appreciate it when people pass it on to adoptive parents and others touched by adoption in some way. It always helps when people use that little share button at the bottom of each post to repost to Facebook. Everyday, the majority of my readers get here by clicking a link on Facebook. I very much relate to post. 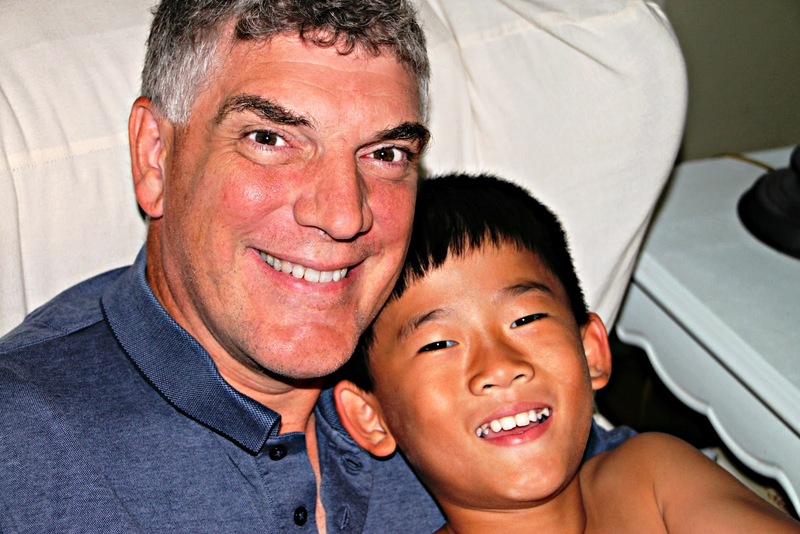 My kids were 7 1/2 and 8 when adopted and had spent their entire lives in an orphanage. We knew nothing about my daughter's asthma until we found her in a full-blown attack six months after she arrived. It took several years to get that under control. The day before we signed the papers, my soon-to-be son had a fever of well over 100, on the verge of sepsis. Searching his skinny body we found a huge blister from some sort of bee or spider bite. So we had to teach him about how to take care of bites before he even learned English. We don't know about family history, but it's clear that my son probably suffered from fetal alcohol syndrome and has alcoholism in his DNA. And we haven't even started on the lost personal/family history. They are in their 20's now and seem content with how things stand. If they want to pursue history, we will help. For now we let it stand. As for the SEO thing, one thing I've learned from my blog is to have a set of three or four key tag terms that get used regularly. For example, EVERY post you have should include the tags "international adoption" and "China." If you do that, then add the term "adoptee medical history" you increase the odds of this particular post being found. Julie - how do I include "tags" in every post? Do I just make sure those terms are in every post? In the title? Can you share a little more? Tags are also called "labels." I use Blogger, so for every post I have a box on the left I click on and type the key words that might help people locate me through a keyword search (e.g., midlife reinvention, travel, writing inspiration, my name). The labels you listed for this post are not terms people would search for if they are doing initial research on international adoption. You can still have them as your own personal categories, but ADD to the labels you have. You don't have to go all crazy with SEO because you're not trying to sell anything. However, if someone wanted to research medical issues for international adoptees and your blog had a post with the labels "international adoption" and "medical issues" you'd perhaps be on the first page of the search items. One time I put the name of a popular singer in my label list and had an astounding number of hits. Of course they didn't all stay and comment because they were probably looking for juicy gossip or videos. If you put your own name and "international adoption" in every label list, eventually you will start showing up high in the google search list whenever someone googles one or the other. If you just start looking at what other bloggers or online news stories do, it will start to gel. Thanks - that was my question -- are tags the same as label! So helpful. Dana, my daughter (adopted from China age 6) had to do a similar project last year, only it was a timeline of their life. We started out trying to divide the timeline up into relatively accurate time periods, but when we started filling in the information, the period from almost age 1 to age 6 was such a huge blank space (the period of time she was with her foster family), I suddenly realized we had to compress that period or she'd feel like she had lived in a huge black hole. I also knew it would prompt a lot of questions from the kids that she wouldn't be able to answer. I tried to get information from her to fill in the time during that period, but she couldn't remember anything to put down, so we squeezed those years together closer than the rest. We were also supposed to attach pictures. Thankfully, we had been able to make contact with her foster family after she came home and they had sent us a baby picture from about 9 months and a couple of pictures from about age 4 or 5. I'm not sure what we would have done if we hadn't had those. I know she would have been affected by it and I'm not sure she would have wanted to do the project. Seeing that huge space just really made me even more determined to try and find some more answers for her.